I forgot to say in my last comment how much I enjoyed your haiku. :) I liked them all, especially the first one. Thanks again! 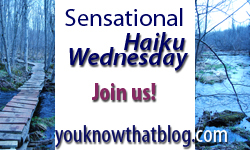 Thank you for hosting Haiku Wednesday. This is my first entry, but I am sure not my last. Happy Day! Now I’ve lost my nose. Now they’ve grown very big. Loved the first two ! very relatable and wise !! the last is my fave Jenn very sweet! I like to try and figure out the meaning behind these as I read them so I can do a quick psychoanalysis – kidding! Very nice…. Your’s are so good! The second one is my favorite. beautiful haikus jane, all of them. thanks for this splendid theme. Beautiful haiku! Wise words to live by. The last one is my favorite. Like you, I am “thankful for guidance.” Unfortunately, I don’t seem to be getting much of it these days! Oops! I forgot to add my name to the linky yesterday – sorry!